Most of “bamboo” furniture we see in the mall, magazines or in the internet is actually faux bamboo. Its furniture made with a variety of woods, including pine, oak and maple, and carved or turned to resemble bamboo. This is done to get the special look of bamboo, but with more easily joined surfaces that result in sturdier furniture. Surprisingly, this is not a new technique at all. The Chinese have been making faux bamboo furniture since the 1300s. In this list we’ll use “bamboo” for both faux and real bamboo. 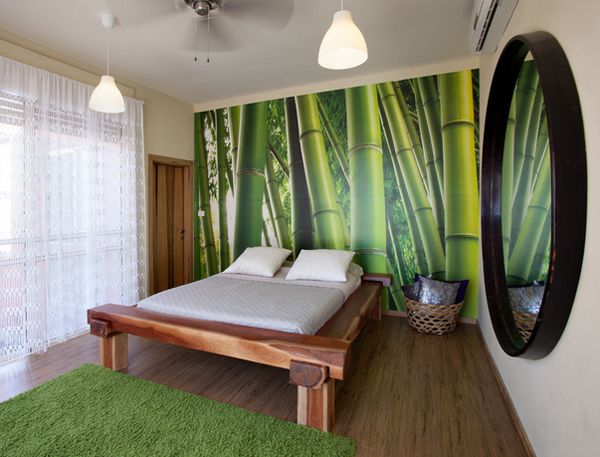 For more ideas on what we are telling you about, check out the pictures below of bedrooms with a touch of bamboo in them. 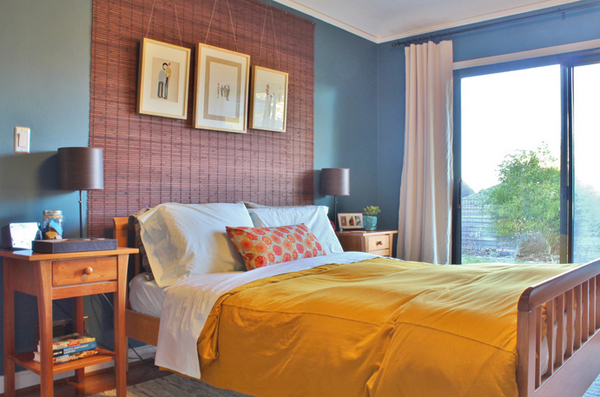 Curtains, shades, cornice and shade for smaller window; love or hate them? 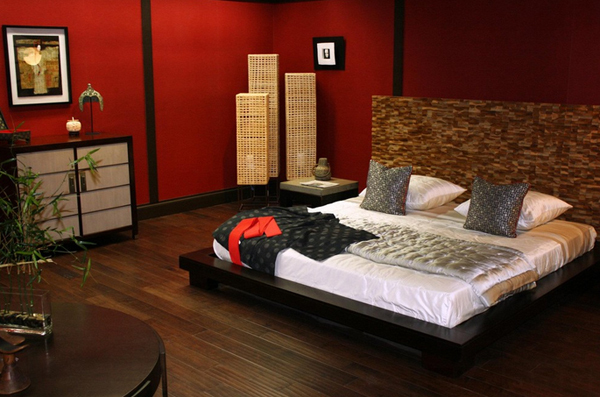 This Asian Style Master Bedroom was created for a show house at The Design Center of the Americas. 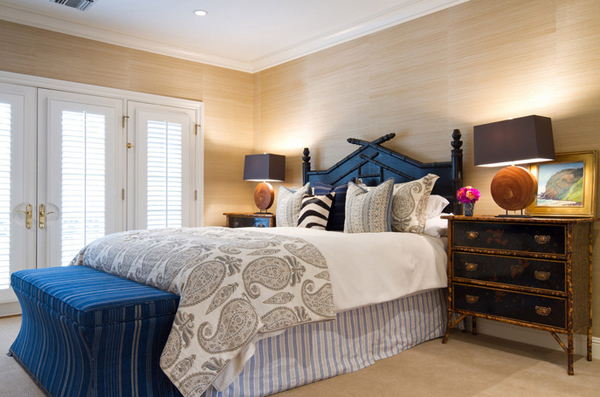 Look at the details on the head board and the flooring? Here is a simpler example of the same chinoiserie technique applied to a bamboo chest of drawers. Black is the most frequently used color in chinoiserie; examples in red, yellow, green and white are rarer. 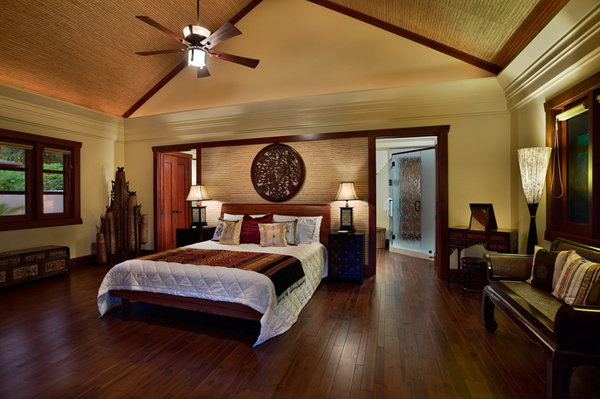 Custom tortoise shell bamboo bed in a room with eco-friendly features. 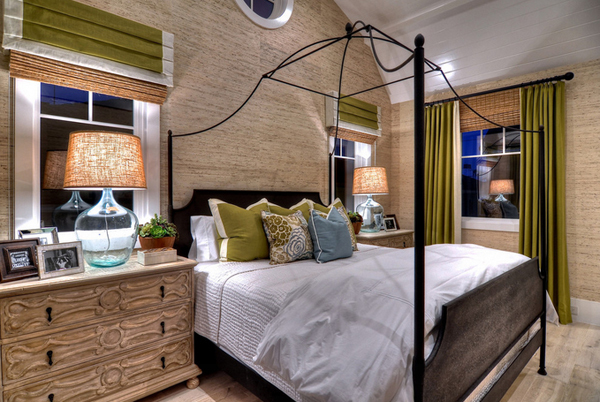 This is one bedroom eco-friendly people would love. Exhibiting strength and natural beauty, this bamboo bed’s style and structure will stand the test of time. A sustainable resource, bamboo is one of nature’s gifts that keeps on giving. Here the panel track has been left exposed to reveal its simplicity. The panels can be very lightweight, in which case sliding them out of the way is easy. 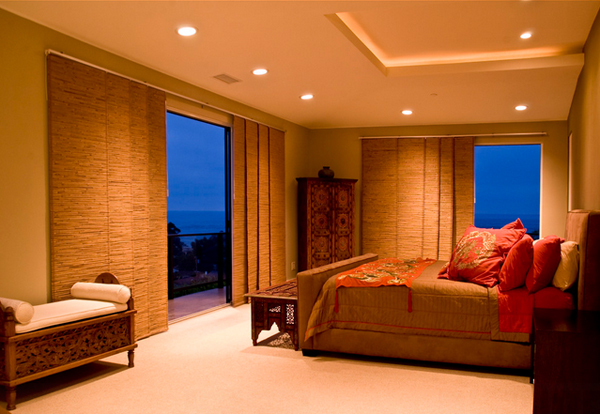 The material of these resembles bamboo or woven wood, which is commonly used in Roman shades. Example of horizontal paneling on the walls is gorgeous! The bed is the most interesting part of this bedroom though! 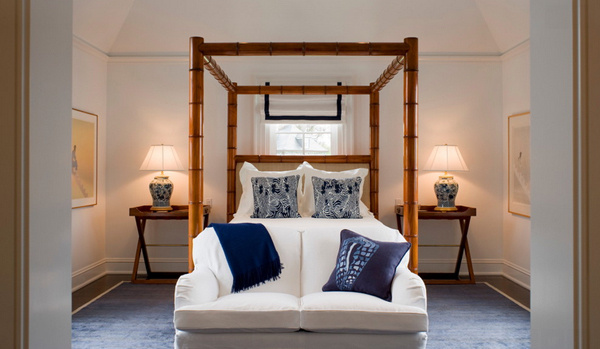 The caned bed adds some British colonial style, as do the linens, by John Robshaw and Peter Dunham. A dhurrie rug grounds the room with soothing texture and is durable enough to stand up to the beach. 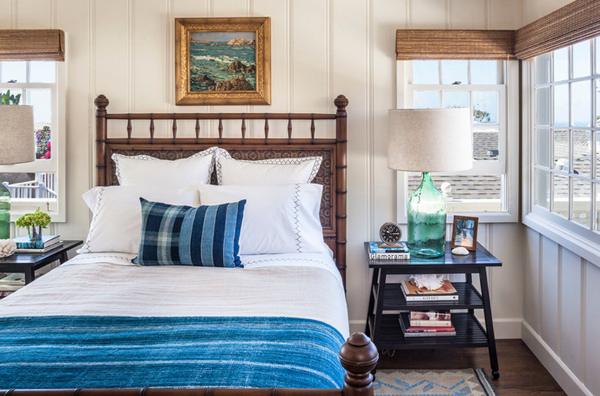 Collins’ passion for restoring Laguna Beach cottages continues; he completed another renovation after this one was done and is currently working on another. 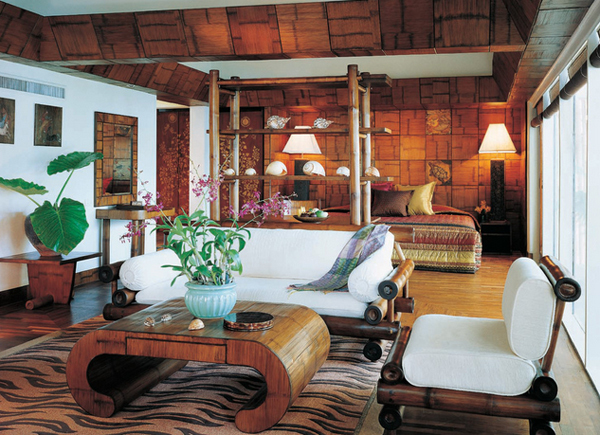 The ceiling material is a bamboo wall covering that was provided by the owner. You might be able to find something similar at Bamboo Maui. 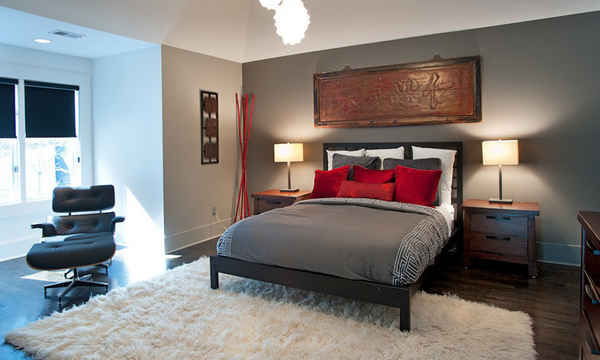 This Nashville bedroom has a small touch of Asian in it but totally contemporary and something I’d love to have! Back to a more lavender-y periwinkle. Mixing several shades of purple into the room makes the space feel richer and, in effect, highlights the periwinkle. Keep in mind that many wood tones read as orange. 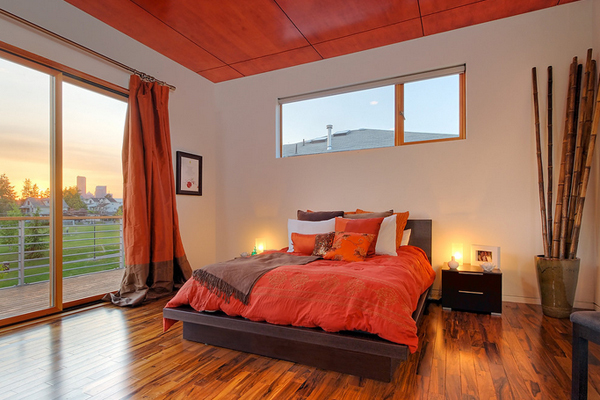 So if you want the warmth of orange in your bedroom but desire a softer, more organic look, bring in orange-toned wood elements via flooring or ceiling cladding. 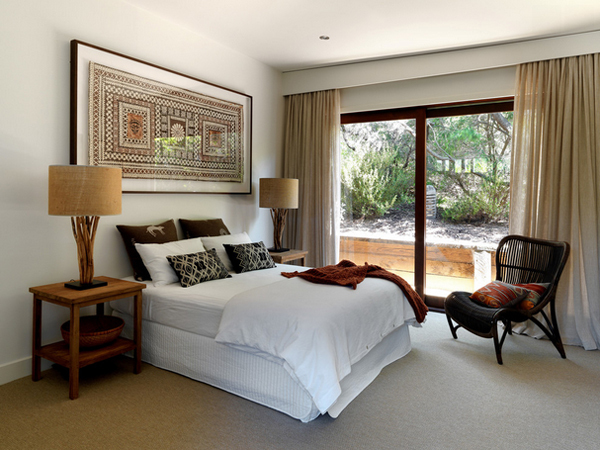 Totally love this bedroom! 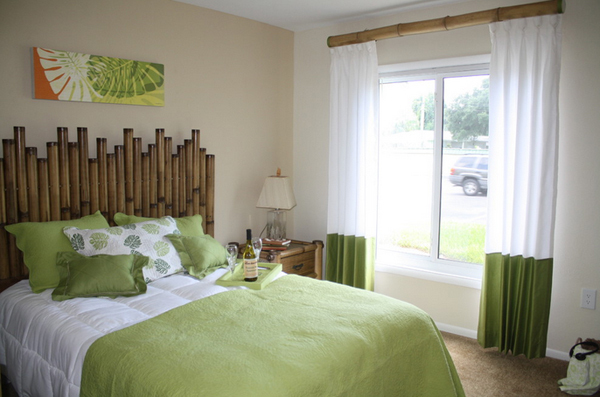 The bamboo posts of the bed is sure lovely and really feels like the beach! 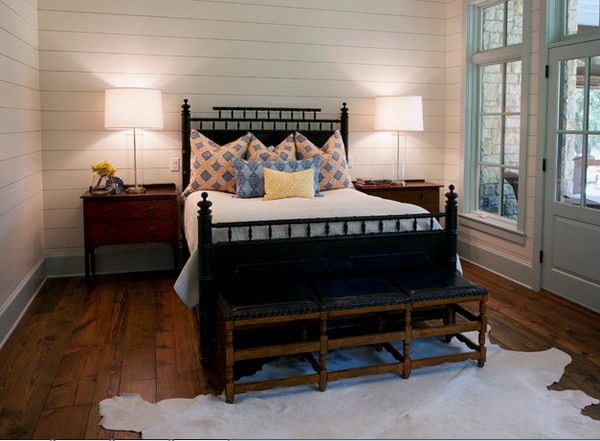 Stained Glass, also by Benjamin Moore, enriches the bedroom, providing an anchor for two screens and artwork. 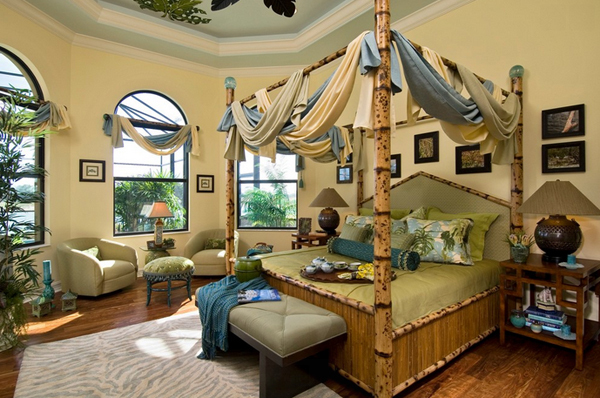 Everything about this Hawaii bedroom is beyond words! 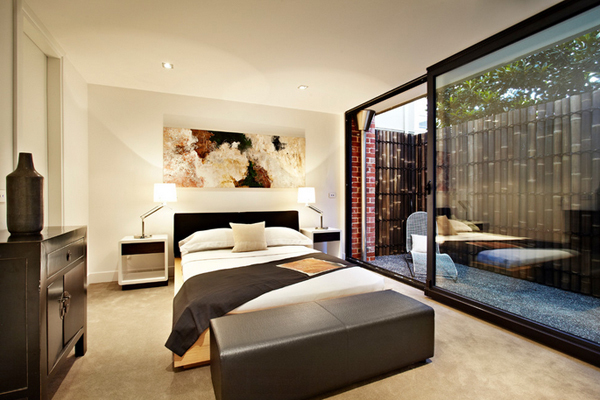 This Melbourne home is really stunning – notice the bamboo wall beyond the glass sliding door. A bedroom with view of nature on the outside – pretty awesome! A thick curtain rod breaks up a monochromatic wall, draws the eye upward and makes the ceilings appear taller. We love pairing bamboo with a crisp, white linen fabric. The combination gives the room a touch of summer all year long. Floor-to-ceiling wainscotting adds sophistication to a room dominated by rustic furniture. Dark toned wood floors contrast beautifully with the white paneling. This sure is one way of creating an outdoor feel for your bedroom but I am not so sure if zooming in the picture actually makes it more pretty or what. The bedrooms we have showed you above might have been simple and very Asian at some point, but most of them are contemporary that they surely go with the times. Like what we have mentioned above, some of the beds or decors above that are “bamboo” are not necessarily original in a sense – but we still surely love each one.